The article represents the summary of the Holocene moraines and glaciers of Tien-Shan, Pamir and the Himalayas study with the aim of long-term forecast of climatic and glacial changes. The model of stadial decaying degradation of the Holocene glaciations in the Central Asian Mountains was offered. It was shown the significant importance of combination of radiocarbon, isotope-oxygenic and uranium-isotope research methods of the Holocene glaciers and moraines for detailed differentiation of the Holocene glaciations. The problems related to the global warming are becoming more acute and go beyond the scope of states, gaining regional and interregional dimension. One third part of the world’s population is climate depending; states of Central Asia and Africa are the most vulnerable. Global climate warming and degradation of glaciers as a result will lead in near future to shortages of water and hydropower resources in almost every state of Central Asia, where is a significant proportion of river runoff of glacial genesis. This means that in the near future, Central Asia may face with water and energy and environmental disaster. The expected water shortages will inevitably escalate the already existing conflict between the Central Asian states on the issue of transboundary water resources management. In this regard sustainable long-term (for many decades and centuries) forecasting on climate change and glaciation is very important. Such a forecast will allow to take timely measures on adaptation in changing climate and mitigate climate change impact. Errors in forecasting of dynamics of climate change are fraught with large economic accidents. Miscalculations of experts of 50-60s of the last century, concerned with fall in the level of the Caspian Sea 30 years later turned into social and economic tragedy for the whole region. The existing models of long-term glacial and climate change forecasting don’t enable us to make reliable forecasts even for the next 100 years. Thus, according to various estimations, obtained by the climate models, on which the Intergovernmental Panel on Climate Change (IPCC) under the UN referred to, the average temperature of Earth surface in the XXI century could increase by not only 1.1 but also 6.4 °C (http://ru.wikipedia.org/wiki/Глобальное_потепление). Significantly opposite prognostication scenarios are suggested for such significantly different forecasts of temperature rising – from global climate disaster (rising of World’s water level followed by underflooding of near-shore areas, more intense and frequent weather phenomena resulted in hurricanes, typhoons and flooding, drought in Central Asian and African regions) to changes of little consequences, excluding earth cataclysms (www.gepl.narod.ru). There are enough reasons to believe that modern warming represents the part of natural cycle of climatic fluctuation. That is why long-term forecasting of climate and glaciations should be based on (and this is already applied) regular patterns of natural climatic and glacial changes which had been taking place throughout the long period of time – at least the Holocene. By this time, such regular patterns are not established, this results in impossibility to obtain relevant forecast. The last significant fall of temperature in the Northern hemisphere, known as “Little Ice Age”, happened in the mid of the second millennium a.d., after that, approximately 200 years ago warming took its place and lasts in our time. The question on how long this warming will last and how “deep” will glaciations degradation and what will change the warming is very important and open. Nowadays there are a lot of highly contradictive paleoglaciological schemes, for the Holocene inclusively. Among the lasts there is a model of stadial degradation of the Holocene glaciers and the model of their quasistationary states, implicating relative stability of climate in the Holocene. Paleoglaciological and climatic regular patterns are established mainly by the methods of quaternary geology. The most significant marks of climatic temperature falling are moraines which represent the most reliable and informative material signs of glacial periods. Results of traditional researches of quaternary geology and paleoglaciology are full of profound contradictions. During INQUA (International Union for Quaternary Research) in 1957 was made a conclusion: “The request on stratigraphic scale of Quaternary period sent to 22 countries received 22 different responses”, and in Congress hold in 1973 was stated that the situation did not change to a better (Bowen, 1981). By now, 40 years later, the situation did not become better, because traditional methods could not identify even the number of Pleistocene glaciations and was not received reliable absolute dating of moraines – the most important paleoglaciological and stratigraphic marks of the Quaternary period. 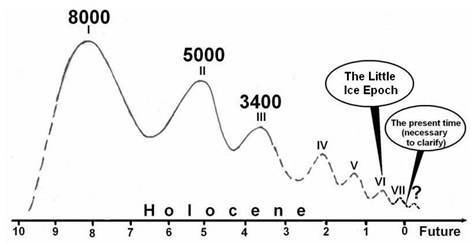 According to Penk’s and Bruckner’s alpine model there were 4 glaciations in the Pleistocene (John B et al., 1982); according to Kukla’s loess stratigraphy there were about 18 “glacial cycles” for the recent 1,8 millions years ; according to proportion of isotope-oxygen in deep-water oceanic sediments it is supposed that the Quaternary period included 17 glaciations (Bowen 1981). It is assumed that examination of oceanic sediments made a breakthrough in paleoclimatology and quaternary geology. However, as is shown in , the obtained results are ambiguous and contradictive due to a lot of assumptions and theoretical beliefs lying in the core of used methods. 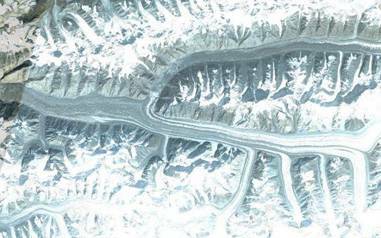 Mountain glaciers react more sharp on climate changes. That is why in long-term forecasting of climatic and glacial changes paleoglaciological researches of high mountains regions are the most important. At that, the main study objects are moraines of epochal and stadial glaciations of the Pleistocene and the Holocene. 1. Incorrect genetic typization of moraines and pceudomoraines. 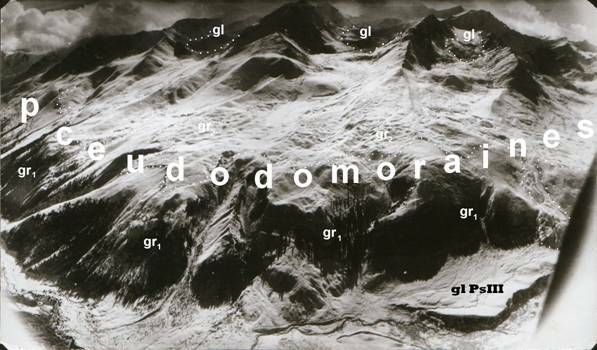 As main climatic and stratigraphic marks of high mountain regions researchers use not only true moraines but pceudomoraines, improperly take them for moraines. Traditional field methods do not allow to correctly differentiate true moraines from morphologically similar formations of nonglacial genesis – pceudomoraines. It was shown that incorrect genetic diagnostics of moraines and pceudomoraines is what mislead researchers dealing with paleoglaciological reconstruction of mountain areas by traditional methods. For the Tien-Shan, Pamir and partly for the Himalayas, on the base of developed by us quantitative facial-lithological indicators (geochemical, granulometric and others), it was determined that all morphological formations of mountain areas, traditionally taken for early- and midpleistocene moraines, as well as significant part of such formations taken for latepleistocene moraines, in fact are latepleistocene-holocene pceudomoraines, which true genesis is gravitational; they are represented by wide-spread landslides (by widely developed landslides). 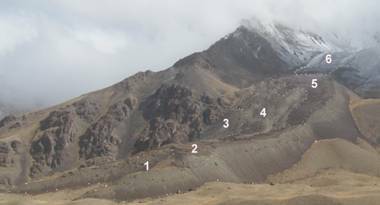 Figura 1-4 show examples of moraines and pceudomoraines in the mountains of Tien-Shan, Pamir and Himalayas. 2. The lack of reliable moraines dating. Applied physical methods of dating (radiocarbon, thermoluminescent, beryllium, etc.) do not allow to establish authentically the age of moraines. Traditionally moraines considered as chronologically “dumb” formations for the most widely used method of radiocarbon dating, as there was not found necessary autochthonous organic matter in moraines. All radiocarbon dating of moraines were obtained exclusively by allochthonous organic matter, either autochthonous, but it was revealed not in the moraines, but in neighboring sediments of different origin, nonglacial. In this case the following question was open - how younger or older than the moraine the obtained dating? Moraines were not dated by autochthonous organic due to the fact that such organic was not only detected in moraines, but even there was no possibility of finding it there. As pceudomoraines often improperly taken for moraines, so their dating obtained by physical methods is mislead, especially in prognostic aspect. Identification Marks to the Figura 1-4.
gr2 – stadial Latepleistocene moraines. 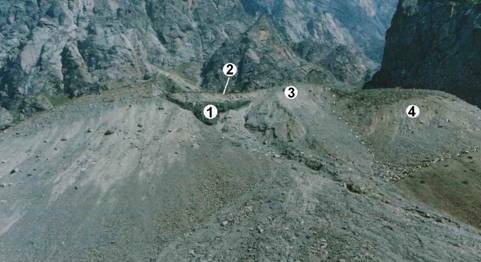 Arrows indicate on area and direction of slumping of polygenetic slope detritus, formed pceudomoraines. Both these problems can be resolved with the help of methods we offer for moraines and pceudomoraines differentiation and receiving of reliable moraines dating by using autochthonous organics by the method of radiocarbon dating. For reliable differentiation of moraines from pceudomoraines we received genetic features of these sediments in the form of quantitative facial-lithological indicators (geochemical, granulometric) (Shatravin, 1994a; Shatravin, 1994b). Application of these data in the mountains of Tien-Shan and Pamir allowed us to found out that only Pleistocene glaciation had existed in these areas and had place in late Pleistocene. 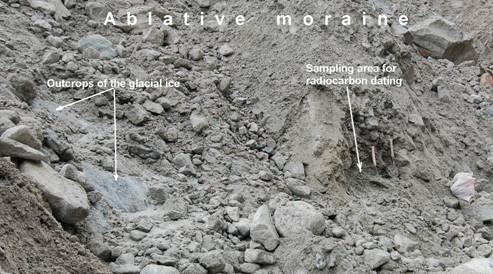 In moraines we have found autochthonous glacio-chionophilous (special glacial) fine-dispersed organics disseminated in fine-grained morainic material; its nature was identified and shown the possibilities for this organic usage for radiocarbon dating of moraines. Methodological approaches were offered for carrying out the complex of field and laboratory works preceding radiocarbon analysis of morainic samples. Together these approaches represent new unconventional approach for radiocarbon dating of moraines and allowing to identify accurately the age of moraines ( Shatravin, 1998; Shatravin, 2007b); this approach is applied successfully for dating of Holocene moraines of the Tien-Shan (Shatravin, 2007a; Shatravin, et al., 2011a; Shatravin, 2012). In parallel radiocarbon analyses were carried out in two independent laboratories – in the Laboratory of Geochronology of Saint-Petersburg University (Russia), using traditional radiometric facilities; and in Viennese Atomic Institute (Austria) with the use of AMC technique. Good repeatability of results was received. This permits to accept the dispersed organic method for radiocarbon dating of moraines. 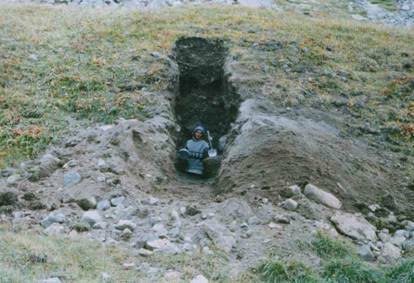 It should be mentioned that the selection of samples by this method for radiocarbon dating of moraines is very effortful: in order to select own sample it is necessary to carry out excavation in moraine attaining several cubic meters (Figura 5). However, there are no alternatives for this method of moraines dating. not less than seven main stages may be found out (Shatravin, 2007a; Mamatkanov et al., 2010; Shatravin, 2011a; Shatravin, 2011b; Shatravin, 2012). Their exact amount, as well as the amount of small stage moraine line to be identified. Moraines of little glaciers, mainly corrie glaciers are the most appropriate for radiocarbon dating of Holocene moraines and relevant paleoglaciological reconstructions. Little glaciers are located away from the centers of mountain ranges glaciations and that is why they react more sensitively on climatic changes, graving such changes in form of stadial moraine shafts. The following radiocarbon dating were received for the first three stadial moraines of Holocene glaciations of one of moraine-glacial complex of the Tien-Shan (Figura 10): 8000, 5000 and 3400 years ( Shatravin, 2007b; Mamatkanov et al., 2010; Shatravin 2012). On the base of the received data we offered the scheme of stadial degradation of the Holocene glaciation in the mountains of Tien-Shan (Figura 11), which took place according to the principle of damped oscillations ( Shatravin, 2007b; Mamatkanov et al., 2010; Shatravin, 2011a; Shatravin, 2011b; Shatravin, 2012). long-term forecasting of glacial and climate changes, as on its amplitude (future next splash of modern glaciation), starting time and duration will depend climate and glaciation in foreseeable future not only of the Tien-Shan, but the whole Central Asian region. The dating of the other stadial moraines – is a way to long-term forecast of glacial and climatic changes. This scheme may serve as a basis of accurate long-term forecast on which anthropogenic factors of glaciations and climate changes in Central Asia should be imposed. Certainly, this scheme requires significant improvement by receiving the dating of other stadial moraines of the Holocene glaciations. For more detailed paleoglaciological reconstruction of the Holocene glaciation radiocarbon dating should be combined with isotope-oxygen (basing on ratio of isotopes 16О/18О) and isotope-uranium investigation of glaciers. Isotope-oxygen studying of glaciers became rather popular among glaciologists; they count on the results of such researches to use them in paleoclimatic reconstruction and in long-term forecast. For this purpose, in mountains of Eurasia a number of the Tien-Shan, Caucasus, Altai, Tibet and Himalayas, as well as Scandinavia and Antarctica glaciers has been drilled by this time. However, a weak point of the isotope-oxygen studying of glaciers is definition of absolute age of ice cores. It is performed with the use of ratio-based models of age and depth of glacial thicknesses, constructed on the basis of characteristics of flow (Bowen, 1981). The method of radiocarbon dating of moraines we offer allow to date the isotope-oxygen temperature curve of past received during drilling of mountain glaciers, that is to adhere it to reliable age scale. For this purpose, it is necessary to select series of samples on contacts of glacial ice and a superficial (ablative) moraine covering (Figura 12, 13). Samples of ice will be used for isotope-oxygen analyses and samples of autochthonic organic substance from moraines will be used for radiocarbon dating. Glaciers in mountains are not only reducing by size but also are shielding, that is covering by the cover of glacial moraine. All this may lead in foreseeable future to significant reduction of glacial runoff. At the first stage of glaciers shielding (when the thickness of moraine cover is insignificant), their melting is accelerating and increasing the module of runoff. Further, the increasing of thickness of moraine cover will lead to reduction of ice melting, up to its complete termination. Glaciers in this case like conserved (Figura 14-15). Shielding of glaciers is going very intensive. Figura 16 shows the example of shielding Ak-Say and Uchitel glaciers in Kirghizskiy Range of the Tien-Shan for the recent 40-50 years. 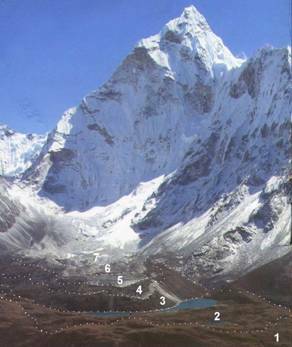 Not only little and middle glaciers are shielding but also glaciers-giants, like Inylchek (Tien-Shan), Fedchenko (Pamir) and huge glaciers of Himalayas (Khumbu, Imdja, etc) – Figura 17-19. Figura 17 Shielded (black background) and open (white background) parts of Inylchek glacier. It is necessary to make long-term forecast not only of glaciations but shielding of mountain glaciations and reduction of glacial runoff caused by it. 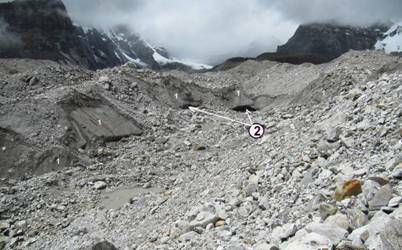 How quickly will modern glaciers in future “go” under moraine? 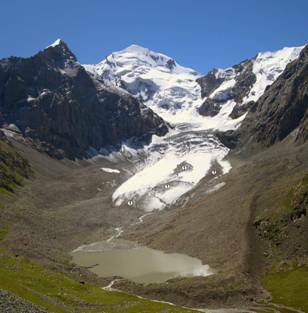 What will affect glacial runoff more – reduction of glaciers sizes or their shielding factor? We need to answer these questions studying shielding glaciers, as well as tendencies and speed of shielding in forecasting aspect. The glacier runoff from shielded parts of glaciers is in contact with moraines deposits and as it had been shown earlier (Tuzova, Shatravin, 1994; Tuzova et al., 1994) it leads to increase of isotope shift in the uranium of glacial waters, i.e. to increase not only off general content of uranium in thawed snow, but also to increase of 234U excess in them. Complex researches of open and variously shielded (according to thickness of moraine cover) glaciers with the use of isotopic methods are required. It is necessary to study modern representative moraine-glacial complexes for future forecast objects. It is important to allocate morphologically apparent stadial moraine-glacial generations in them and define a share of actual glacial runoff and runoff from variously shielded moraine-glacial generations. 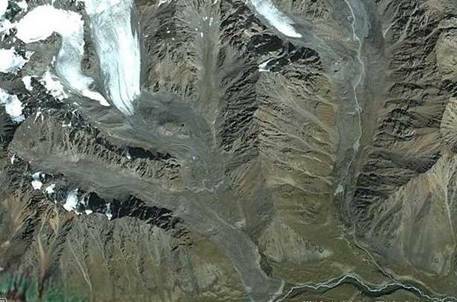 There are reports on threateningly fast degradation of glaciers in the Central Asia. 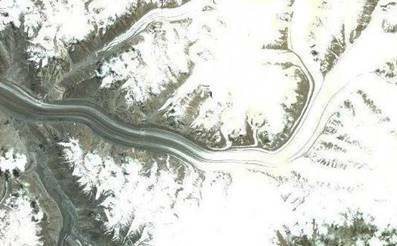 Thus, in www.climatechange.ru/node/4 it is stated that the thickness of Himalaya glaciers thaws with a speed of 10-15 m/year and 2/3 of glaciers of China will have disappeared by 2060, and by 2100 the glaciers will have melted down completely. According to (The Second National Statement…, 2006), the quantity of glaciers in the Tien-Shan located on the territory of the Kyrgyz Republic can be tens times reduced by 2100. Only open parts of glaciers were considered during estimation. In this connection, the forecast of glacial disaster in above-stated sources is not well founded. To obtain the objective picture, it is necessary to study shielded glaciers, including their historic-genetic aspect with the use of modern isotope methods. 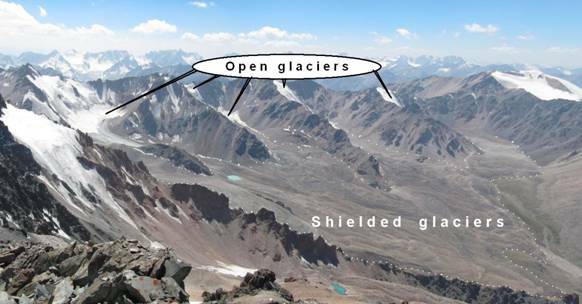 It should be mentioned that there are no separate Holocene glaciers or moraines in the mountains of Tien-Shan, but there are moraine-glacier complexes. 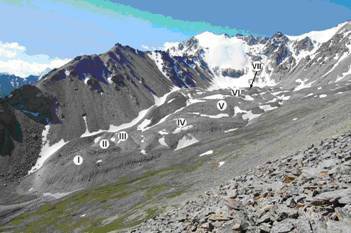 Figura 12, 13, 21 show the outcrops of glacier ice in moraine-glacial complexes of the Tien-Shan and Himalaya. This complexes contain significant resources of ice in the form of ice bodies shielded by moraine covers. Ice resources in moraine-glacial complexes are some kind of preserved stocks of ice, which give water at a slower rate than open glaciers do. Their runoff is rather steady during all the seasons of a year. Figura 20 shows the Holocene moraine-glacial complex of a glacier and the Karabatkak lake, which are under study of the Tien-Shan High Mountain Research Center (TSHMRC) under the Institute of Water Problems and Hydro Power of the National Academy of Sciences of the Kyrgyz Republic (IWP&HP NAS KR). In the foreground of the Figura 20 (from every side of the lake) – are not moraines, but glacial bodies of different age generations shielded by ablative moraines. They (and other, similar to them in different cases) are not listed in the catalog of glaciers of Tien-Shan (Catalog of USSR Glaciers, 1967), where only parts of glaciers marked by the Figure 1 within end part of the glacier were included. 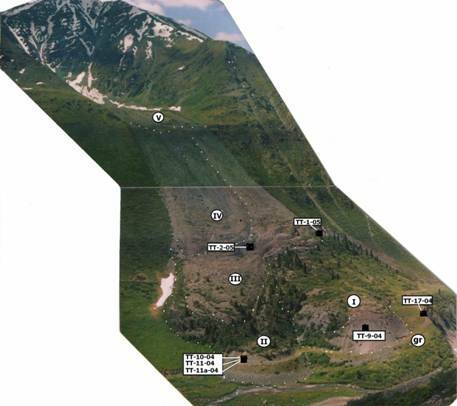 To make long-term forecast of glacier shielding and reduction of glacial runoff caused by it, it is necessary to carry out uranium-isotope researches on the moraine-glacial complexes together with morphological studying and radiocarbon dating. Here we rely on features of glacial lithogeneses and formation of moraines of mountain glaciers established by us, whereby organic matter in form of glacio-chionophilous microorganisms inhabiting glaciers play decisive role (Shatravin, 1994b). This organic matter as well as any other organic substance, sorbs uranium and its isotopes. The uranium-isotopic investigations will let us to allocate generations of different ages in Holocene moraine-glacial complexes and to establish a share of each component in general runoff of mountain rivers, including the runoff from open and shielded parts of glaciers. In order to reliably differentiate moraines from pceudomoraines we have received quantitative facial-lithological figures (granulometric and geochemical characteristics). Application of these figures allows to eliminate initial causes of numerous contradictions having place in Paleoglaciology of Quaternary period. The method for receiving reliable radiocarbon dating of moraines with the use of autochthonous organic matter dispersed in fine-grained morainic material was developed. By the example of the Tien-Shan, Pamir and the Himalayas we have found out that the Holocene glaciations degraded stadially according to decaying principle. 7 main stages may be distinguished in it. Absolute dating of the first free stages was received: 8000, 5300 and 3700 years. On its basis a schematic model for long-term forecasting of natural glacial and climatic changes was constructed. Dating of further stages is a right way to soonest reception of long-term forecast of climate and glaciations. The application of uranium-isotope and isotope-oxygenic researches of the Holocene glacial and moraines will allow to improve (precise and detail) this model. Joining of international efforts are essential for further researches in this direction. Bowen D, 1981. Quaternary Geology. «Mir», Moscow. Catalog of USSR Glaciers, 1967. Volume 13, issue 2, part 1, 2. «Science», Leningrad. John B, Derbishir E, Young G, et al., 1982. Winters of our Planet. «Mir», Moscow. memory of Academician Mirtckhlava C.E. Tbilisi. 159-163.
mountainous areas In: Geology of the Cenozoic and seismotectonic of the Tien-Shan. Papers No 65, dedicated to the memory of Academician Mirtckhlava C.E. Tbilisi. 240-244. Ways for Their Solution», NAS KR, Bishkek. 85-90.
mathematical, mining-and-geological sciences. NAS KR, Bishkek 2(4): 24-27. Management. Field Expedition to Imja Glacial Lake. September 3-24. ICIMOD, Katmandu. Sciences of the Kyrgyz Republic». NAS KR, Bishkek 3(4): 55-59.
the Northern Tien-Shan. In: Water Resources, 21 (2). 236-239. Convention, 2006. NAS KR, Bishkek.